With a newly refurbished exterior, Greene & Greene’s Gamble House is ready for its next 100 years. Sonora, Calif., still has some gold in its hills. Back from the brink: San Diego’s North Park neighborhood. In a new room added to a late-18th-century home in New York State, a collector has composed an outstanding collection of Arts and Crafts objects. 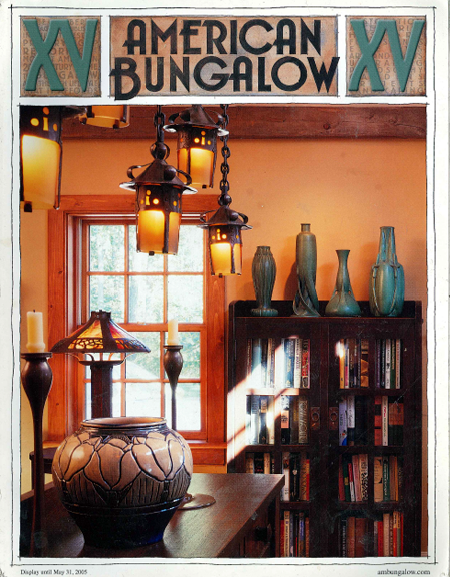 In the foreground is a Newcomb Pottery vase by Leona Nicholson, flanked by bronze Jarvie candlesticks. The extremely rare Stickley table lamp visible near the window is made of oak, metal and stained glass. The bookcase is an early Stickley piece from about 1902, topped with four green Teco vases. Casting light from above is a Stickley shower light made of hand-wrought copper and amber glass. See story page 72. Fifteen years and more to come. as beautiful as the artwork. Focusing on the whole self. Books, cards and CD-Roms for your collection.